One of our key goals since Longleaf Breeze was just a twinkle in our eye was a long season during which we could harvest fresh fruit. We’re still learning what we can expect from our diverse orchard, and every year is different, but we have enough experience under our belt to at least begin to see how our strategy is shaping up. Today’s podcast is our description of what we’re now expecting month-by-month during April through November. We finish with our plans for the other months when we can’t depend on harvesting fresh fruit each day as we need it. Here’s my post describing my slowly changing perception about the best variety of blackberry for us to grow. 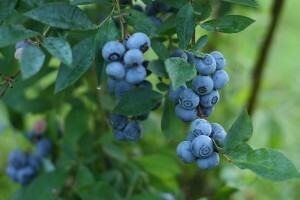 These are premier blueberries, one of our early-season varieties. They’ll be finished within a couple more weeks, and it’ll be time for the mid-season varieties like tifblue and powderblue to step up.